The Healing with Horse Collective is an organization of 3,000 equine-assisted therapists worldwide. And every year, they host an experiential learning symposium. So if you work in this field – I call it the field of 1000 acronyms! 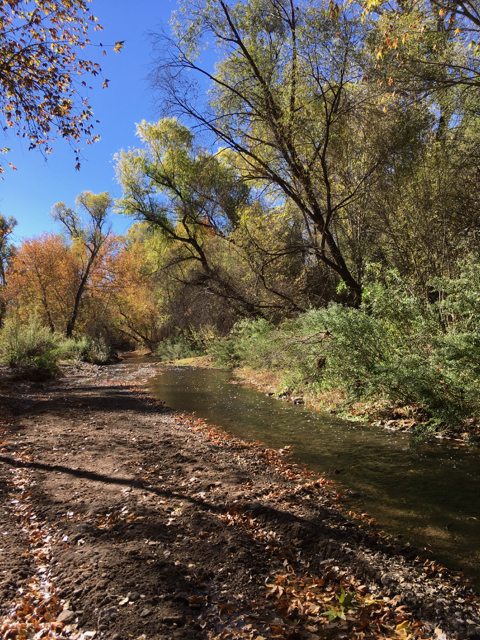 (EAL, EAGALA, EFLC, etc etc) – OR if you are interested in this type of work, then I urge you to come on out to the Symposium this Spring in beautiful Sonoita, Arizona. I visited Sonoita – and the larger, but still small, town nearby of Patagonia – a few months ago and just LOVED the area. Sonoita/Patagonia is a micro-climate within the dry, arid desert we typically associate with Arizona. You will drive through lots of this scrub land as you head south of Tucson, but as the elevation gradually rises to 5,000 feet, the terrain will turn into rolling grasslands and oak trees! If you want to turn this into a vacation as well, I can highly recommend the Duquesne House Inn in Patagonia, while you enjoy the beautiful hiking trails nearby. I actually started off each morning with tea in their lovely garden filled with birds, butterflies, geckos and the neighbour’s cat (who’s decided this is his real home). 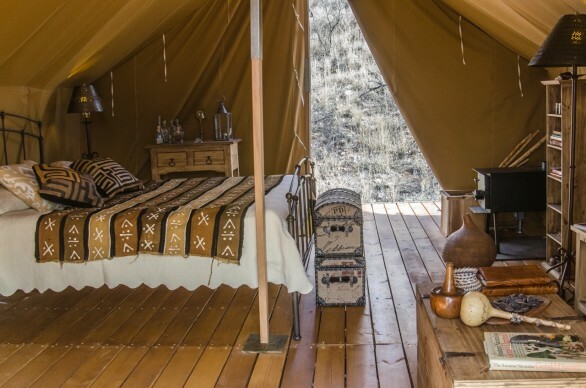 Or you could stay in a safari tent at Raven’s Way while you learn wilderness survival skills (including foraging for food and medicinal herbs) or sustainable living practices. If you’ve ever longed to immerse yourself in nature and acquire some pretty nifty skills, this is the place to go. I’d actually like to come on a vacation here with my kids – I can’t think of a more important facet of their education. If you want a trail riding vacation, then you could stay at Circle Z Ranch, where their herd of 100 horses only works half the year, and is turned out onto 700 acres every evening to rest, roll and forage until the next morning. During the 6 months the horses don’t work, they roam freely over almost 6,000 acres of gorgeous terrain. The horses I saw in the corral were not your typical dissociated trail horses and seemed pretty content, engaged and curious. I didn’t ride there, I just looked around and met some of the staff. I have to say, I’ve been going to Phoenix for over 25 years (my parents have a home in Scottsdale) and I’ve visited quite a few towns, and of course, Sedona and the Grand Canyon area, BUT this tiny town of Patagonia is my favorite! I’m so looking forward to going back and seeing what Spring there is like. 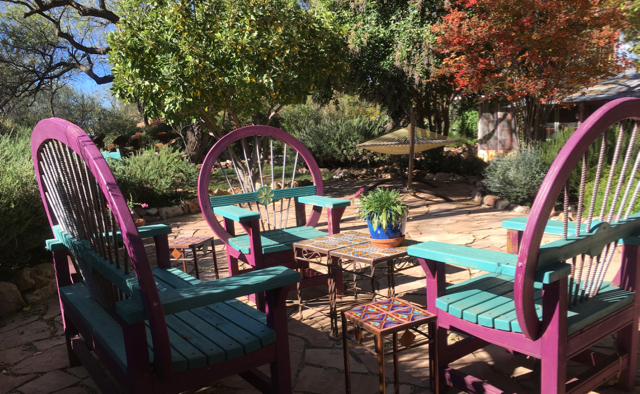 Tubac is also very near Linda Kohanov’s ranch, in case you want to do a workshop or session there. 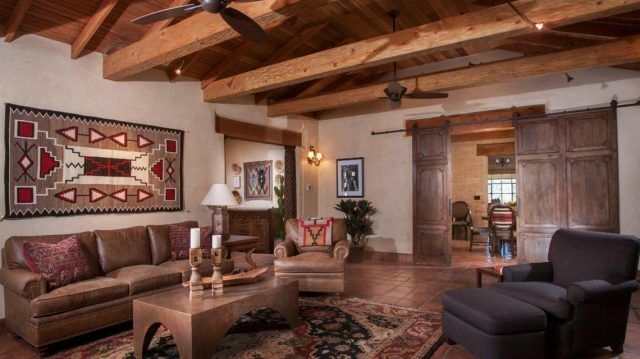 I stayed at the nearby Amado Territory Inn and was very happy there. 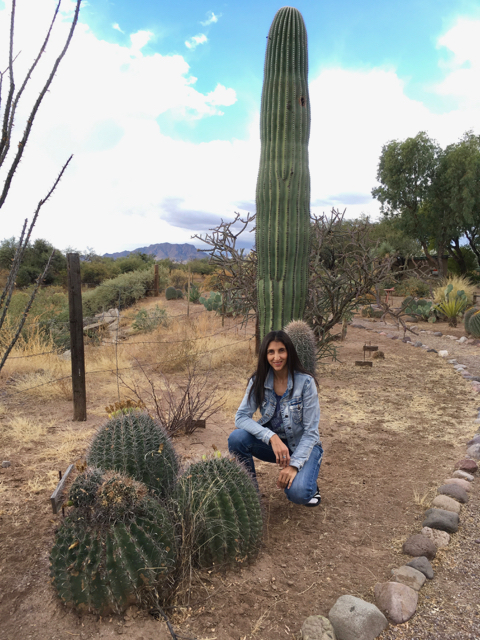 Me outside the Amado Territory Inn – this is more what you expect from Arizona! AND speaking of Linda Kohanov – she is one of the keynote speakers at the Healing with Horse Symposium and she will also be leading an extremely reasonably priced 1-day workshop after the Symposium. Koelle Simpson (did you read the article about her in Oprah magazine?) is the second keynote speaker. Live Demonstration Facilitations with Horses: Learn by being active observers as presenters show a model, exercise, or illustrate a concept with horses. Smaller Group Facilitations with Horses: Twice each day, you choose your favorite topic and join a more intimate experiential learning group. In these smaller breakout sessions with horses, you will be a participant in interaction with the horses. Learn an aspect of facilitation, and how it feels to experience the process. Apply your learning to your own practice. But many people are staying at some of the B & B’s I already mentioned above, and some are camping. The Symposium number of attendees is kept low enough to guarantee personal experiences, intimate networking, and horse time, but high enough to meet and make many new friends and connections. If 2017 is a year in which you could really find value in gathering with your tribe to shift, restore, heal, learn, and commune, then click here to learn more about this truly profound experience. This will be my first time attending the Symposium (all presenters are also attendees and helpers) and I am very much looking forward to it! Jini, this is an AWESOME bit of information about the upcoming Symposium! I LOVE LOVE LOVE your knowledge about the places to stay in the area, and I agree that, while I love many parts of Arizona (not least the Grand Canyon), if I were going to live there, I’d find a home in the Sonoita/Patagonia area. 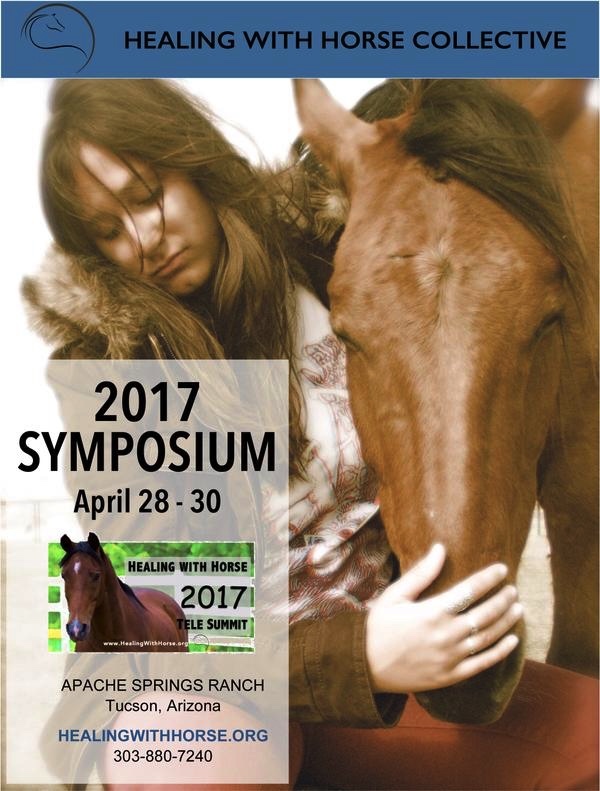 And I cannot WAIT to meet you and everyone at the fabulous Apache Springs Ranch for this year’s 5th Anniversary Symposium. If this year is like 2016 (and I think it’ll be better! ), it will really springboard people into their vocation with horses, and shift the entire field to a new energetic level as well. Both presenters and participants have really launched themselves into areas they never imagined in the months since the 2016 Symposium, as well as finding the heart that has provided resilience for the times when visions get challenged. My hope is that everyone will make the connections, find the support, and learn what they need and want at the conference this year. And I hope that, for YOU, there are amazing connections and forward-moving energy-shifting experiences as you get to meet IN PERSON the people your work supports. THANK YOU for your incredible generosity and brilliance, not just with horses but with business development, Jini, and for sharing it all with all of us!! And one more thing…Thank you for such a lovely write-up! There’s something really magical about Patagonia, isn’t there? Most people I talked to who lived there had come from all over the place (many from big cities) and all felt it was this little gem of a place that they were happy for others not to find out about – so that it stays the way it is. AND despite being so small, there is an excellent organic food store there and several good (non-processed food) restaurants. I hope it stays small, granola and artsy for a long time! And yes, I am very much looking forward to meeting you in person, after all our long conversations on the blog here and on the phone! I’m very excited about supporting equine therapy practitioners grow their businesses and their reach (always advocating for the welfare of the horse, of course!) as I believe the healing of this world needs to start INSIDE of people, one person at a time, and they then flow that healing out to everyone in their family circle. I think youth are especially important – with the turbo-boost of their hormones and not yet being too jaded, I think they are a force that could shift the planet in one generation. So if we can empower them, or heal their parents (which will flow downstream), or the people who work with them… I think that’s a point of tremendous impact. Oh it just all sounds so delicious! I hope you all have a fabulous time…I won’t make it this year as the one downside of the land is …well…you end up kind of married to it 🙂 not a bad deal but my worldly scamperings are looking a little more modest these days. I’ll dream of all y’all while scratching my new pig under her chin.